One of Luxembourg’s main hospitals, the Centre Hospitalier de Luxembourg (CHL), is actively taking part in the European project INNODIA that aims to fight type 1 diabetes. The project receives funding from the Innovative Medicines Initiative (IMI), the world’s biggest public-private partnership in the field of life sciences. CHL plays a key role in recruiting Luxembourg diabetes patients and their families to participate in research carried out within INNODIA. The hospital’s participation in the project has consolidated its notoriety and Luxembourg’s recognition in this research field in Europe and at the international level. Type 1 diabetes is a serious disease that has a strong impact on patients’ lives: they need to have daily injections of insulin for the rest of their lives, and their life expectancy may be reduced with 14-17 years. If left untreated, the disease is mortal. Patients can develop type 1 diabetes at any stage of their life, but it most frequently develops during childhood. There is currently a lack of tools and technologies that would allow clinicians to predict, evaluate and prevent the onset and progression of type 1 diabetes. The goal of INNODIA is to advance the understanding of type 1 diabetes and develop techniques for predicting the rate at which the disease will progress for individual patients. The knowledge and tools generated by the project will help clinical researchers to optimise the design of clinical trials of treatments for preventing and curing this debilitating disease. A patient advisory committee is part of INNODIA to ensure the work is in line with patients’ needs. As Luxembourg prepares for hosting an international conference and networking event celebrating IMI’s first 10 years of funding medical breakthrough on 14 December 2018, Luxinnovation discussed CHL’s participation in INNODIA with Dr Carine De Beaufort, from the CHL’s Pediatric Endocrinology and Diabetes Clinic (DECCP). What is the CHL contribution to the INNODIA project? 5 years ago, two independent initiatives were launched to tackle type 1 diabetes, one on paediatric diabetes and one on diabetes in adults. The European Commission decided to bring the two initiatives together, and the INNODIA consortium was created. The consortium gathers key European players in the field of type 1 diabetes research, including academia, laboratories, an SME and two NGOs, namely JDRF International and the Helmsley Charitable Trust. Combining clinical registries, research groups on the pancreas, imaging and on the humoral and cellular immune system, the partners cooperate to improve the understanding of type 1 diabetes and find out the origin of the disease. The CHL participates in INNODIA at the clinical level. We have recruited two groups of patients: newly diagnosed patients with type 1 diabetes from all age groups, as well as their first-degree relatives who run a higher risk to develop diabetes than people do in general. Within the second group, we try to identify people with a higher risk of developing diabetes by detecting the presence of immune factors signalling a pre-phase of the disease. The Luxembourg project team and our dynamic nurses have made it possible to detect a number of such cases. What kind of results did you achieve? How do they translate to Luxembourg? 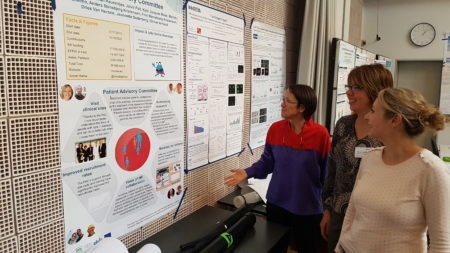 We are very grateful with the level of participation in Luxembourg and can see a change of mind-set, demonstrated by the participation of parents, siblings and the way the team is concretely trying to detect the disease. The work is ethically difficult and we need to proceed with caution, because we ask parents of newly diagnosed children if they want to know if their other children run a higher risk of developing type 1 diabetes. We are very impressed by the willingness of participating families – siblings as well as parents – to participate fully and make any effort needed to help their family member. Their practical and emotional involvement turns this research into a human adventure. In addition, our participation in INNODIA provides us with an excellent opportunity to promote what we do here in Luxembourg in the field of research and biobanking. What did the IMI participation bring to your team at the CHL? Being part of such a consortium has allowed us to review how to better integrate families and encourage them to participate in our research. Among the INNODIA partners, Luxembourg has been a successful country in Europe when it comes to recruiting patients to participate in the project. 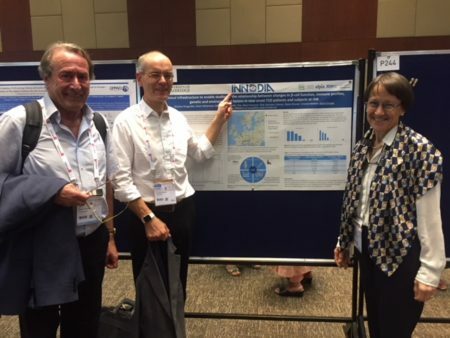 This is to a large extent due to the very active work of our team of nurses, and shows that even a small country such as Luxembourg can be a very valuable partner in a European research project. Luxembourg conducts high-level research in other fields that are relevant for finding out the origin of type 1 diabetes, notably research on the functional aspects of the microbiome. This research topic is not yet covered by INNODIA, but we believe it is a field in which Luxembourg can bring a lot of expertise in the future. Combining our strengths in Europe together with partners from different backgrounds has been and is a great experience, offering in the future a better understanding and maybe a cure for type 1 diabetes. Luxinnovation is the National Contact Point for Horizon 2020, the European framework programme for research and innovation. Building on our decade-long experience of EU funding programmes, we are able to respond to questions on where to get up-to-date information on programmes and calls for project proposals, what programmes are the most suitable for you or where and how to find European partners. 2018 marked the entry into the last work programmes of Horizon 2020, the European Commission’s framework programme for research and innovation. Luxinnovation hosts the National Contact Point services for Horizon 2020 in Luxembourg and can look back on a productive year with exceptionally high success rates for Luxembourg applicants for Horizon 2020 funding. Connected and automated mobility was a hot topic during the last week. While Luxembourg, France, and Germany officially launched the cross-border test bed in Schengen, Brussels hosted a two-days conference, EUCAD2019, where experts also from Luxinnovation engaged in discussions on how to ensure a fast, safe, inclusive, and trusted deployment of autonomous vehicles on European roads. The European Commission launched Thursday April, 4 the first 16 calls for proposals for the European Defence Industrial Development Programme. Applications are open from April 9 to August 29, 2019 at 5pm (CEST). The European framework programme for research, development and innovation, Horizon 2020, offers many funding opportunities for research and innovation projects for the years 2019 and 2020. Luxinnovation recently organised two practical workshops on how to write competitive Horizon 2020 proposals. The Luxembourg start-up LuxAI created QTrobot, a social humanoid robot that can assist in teaching essential skills to autistic children. LuxAI received a €50,000 grant from the European Innovation Council (EIC) and €270,115 from Horizon 2020, the EU Research and Innovation programme with nearly €80 billion of funding available.